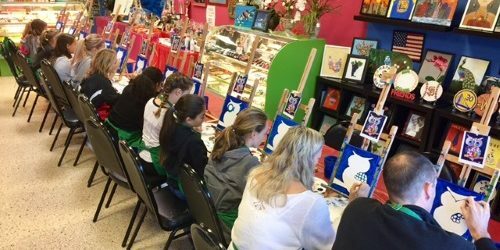 Gather together with your colleagues, coworkers or team mates and join us for a fun painting event to create bonding in a stimulating and relaxing setting to express yourself through art, at Color Bundles. First, contact us to book a date. Then choose a design for the group, either from our GALLERY or send in a personal photo. We will work with you to create a custom-made design to paint at no extra cost. We will sketch the chosen design on the canvases prior to your event, so you can have more fun painting and socializing. Our artists will help all of you, step by step on how to paint your masterpieces! Minimum number to attend is ten. We can also provide you with one large canvas to work on it as collaborative painting. One collaborative painting is recommended for every 10 painters. Please contact us at sales@colorbundles.com for more information. At the end of the event, you would be amazed of the art you will create. Bring in your food, appetizers and drinks to set up your buffet. We will provide you all the art supplies, aprons, paper plates, cups and forks.